Pigeon House Branch is infamous in certain circles. 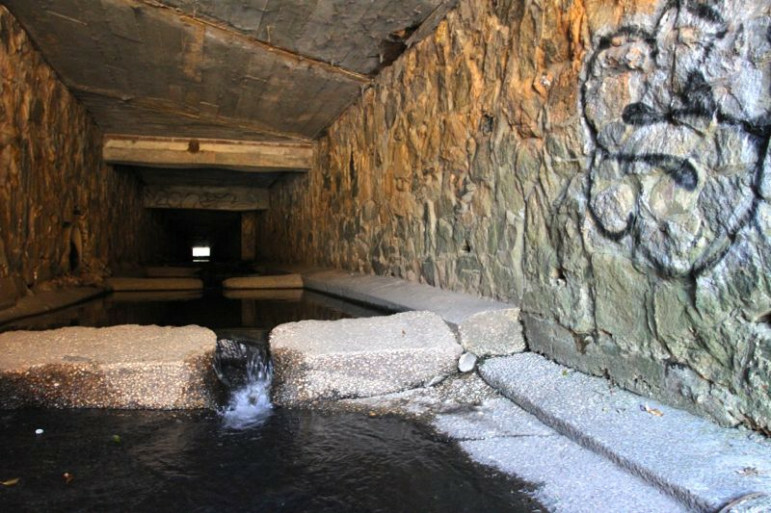 One of Raleigh’s most polluted waterways Pigeon House Branch originates near Cameron Village and runs downtown. It flows under West Street, where it curves north alongside Capital Boulevard and runs until it meets Crabtree Creek, which eventually empties into the Neuse River. Most Raleigh residents who have noticed it haven’t thought twice. But most Raleigh residents haven’t noticed it. That’s because most of the downtown portion of this creek has been culverted into pipes and tunneled underground. However, this long-forgotten and neglected waterway has been a recurring component of city planning discussions in recent years, and with the upcoming replacement of the Capital Boulevard bridge at Peace Street and the proposed reclamation of what used to be Devereux Meadows Ballpark, that conversation is reaching a fever pitch. Raleigh is one of a few cities in the United States that was not founded along a major body of water — a river, harbor or lake. 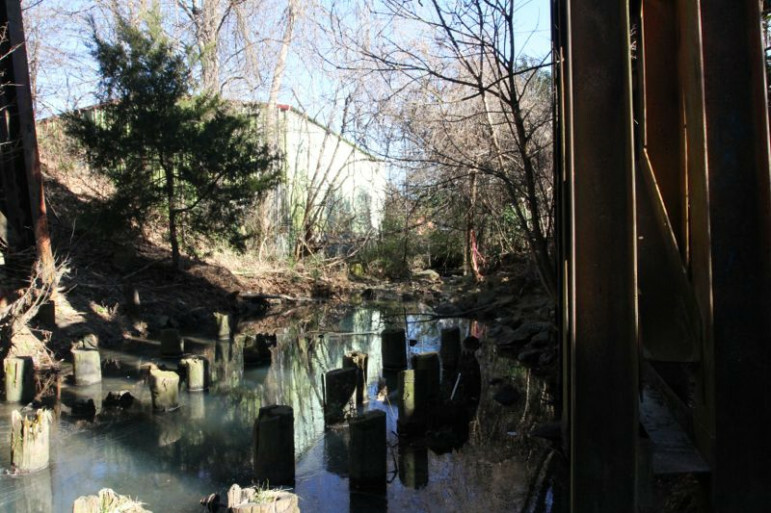 N.C. State University professor Carla Delcambre sees the revitalization of Pigeon House Branch as an opportunity to take advantage of “all of these wonderful smaller creeks” that Raleigh’s geography offers. Once upon a time, these creeks were seen as inconvenient, and Pigeon House Branch was even called “rambunctious” in a 1949 News & Observer article, which discussed plans for “reforming” it. This reformation came in the form of pipes and tunnels that funneled underground so the city could expand above them. Delcambre, though, wants to see a shift in this misperception that Raleigh doesn’t have natural waterways with which to work. “Everyone talks about Raleigh being the City of Oaks, but there are creeks everywhere. Let’s start to promote that, too,” Delcambre said. So Delcambre made the Peace Street Corridor revitalization, and the daylighting of Pigeon House, an assignment for a design studio she taught last spring at N.C. State. Her students’ subsequent work and the conversation around it became the centerpiece of her Urban Design Forum lecture in January. In recent years, the push to develop a comprehensive system of greenways has led the city to reconsider pedestrian and bicycle accessibility to some of its main business corridors. The Peace Street Corridor, with its Capital Boulevard on ramp, falls right in the middle of that category. Designed to address real problems facing the city, the project gave her students a more tangible feel for collaboration in the field with actual urban design dilemmas. The greenway system boasts 28 trails and 100 miles across 3,700 acres in Raleigh. The final portion of the trail is projected to be finished in Summer 2014 and will connect the roughly 28-mile Neuse River Trail — a backbone of the greenway system — to Falls Lake. 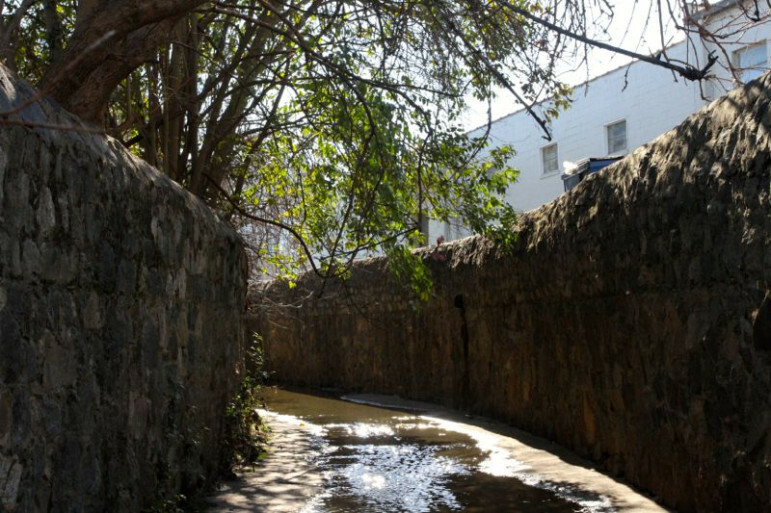 Carla Delcambre hopes that by recognizing the potential these hidden creeks have for the greenways and downtown living spaces, leaders can continue to push forward with a sustainable means of reclaiming the city’s secret waterways. 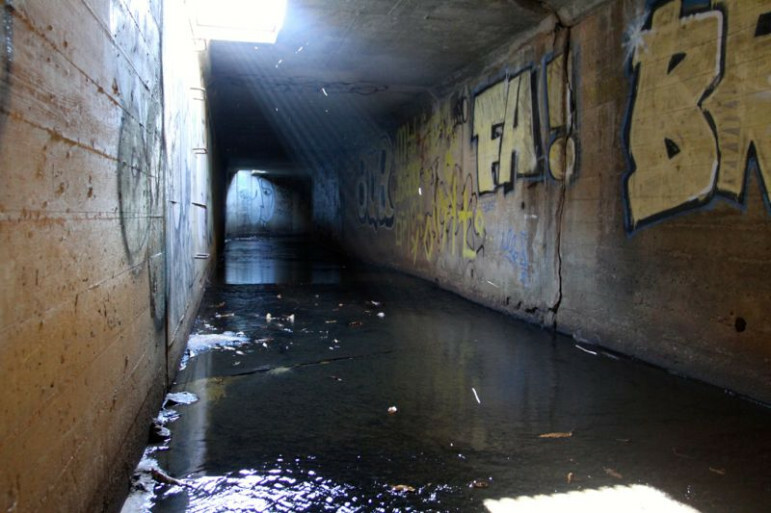 Known popularly as daylighting — a term used to describe the process of bringing streams that were once diverted or culverted underground back into the light of day — uncovering these creeks would not only provide public spaces for those living and working downtown but would also, ideally, work to help repair and restore the city’s waterways. By using certain plants to filter stormwater runoff, a process known as phyto remediation, the city could clean up its waterways by recharging ground water instead of merely pumping it somewhere else. In his book “On the Grid: A plot of Land, an Average Neighborhood, and the Systems that make our World Work,” Scott Huler discusses the origins of the city’s separate sewage system in the late 19th century. It seems the date for channeling the water underground can’t be pinpointed exactly, because the first city planning maps made in 1922 already show about a mile of storm drainage pipes. However, according to Huler’s sources, it probably had something to do with cars showing up. Now, those same cars that forced the creek underground are the catalyst for bringing it back out again. 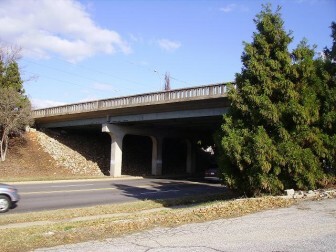 The bridge on Capital Boulevard over Peace Street was built in 1948, and though the bridge is still safe for traffic, it is technically classified as “structurally deficient.” This means it is nearing the end of its life, and the Department of Transportation is working with the City of Raleigh to replace it — and hoping that a tweak in the design will spur new development in the area. This bridge replacement is part of a larger response to the Capital Boulevard Corridor Study Report, published in 2012. This study was aimed at addressing problems related to the roadway and working to revitalize it, making it more user friendly for both drivers and pedestrians while transforming it into a centerpiece rather than an eyesore. While a comprehensive revamp of Capital Boulevard will be expensive, different aspects of the proposal address so many different objectives within the Comprehensive Plan that funding can be drawn from a number of sources at the local, state, and federal level. This means that water quality and ecosystem enhancement funds can be used for stream restoration, and that Devereux Park can find funding in FEMA, the city’s stormwater fund, and future parks bonds for floodplain acquisition and restoration. At a City Council meeting Feb. 18, Council members reviewed DOT plans to replace the Peace Street bridge that are consistent with the City’s Comprehensive Plan for 2030. The state DOT is in the process of conducting environmental studies for the proposed projects, and will hold public hearings in March, with a scheduled date of 2016 to begin construction. The Peace Street bridge could be renovated in 2016. The reconstruction of the bridge will require substantial modification to Capital Boulevard, and this upcoming renovation, in conjunction with the push for the building of a park at Deveraux Meadows, could be exactly the jump start needed to speed up daylighting the downtown portions of Pigeon House Branch. “If there’s kind of this connection that’s happening in the corridor, it could steamroll from one side of the corridor to the other,” Delcambre said. The move to restore sections of Pigeon House Creek is well underway, tucked into other projects and improvements in the works or completed in the past few years. In 2008, the Fred Fletcher Park Water Garden and Wetland was completed as a natural water feature designed to improve the water quality within the Pigeon House Branch watershed while also enhancing the park. In Spring of 2013, 1827 Capital Blvd. was acquired by the City of Raleigh Stormwater Utility in partnership with the Trust for Public Land. This area is located within a median of Capital Boulevard and is prone to flooding. According to the city website, the land was purchased with the intention of working to return this portion of Pigeon House Creek to a more natural condition. Devereux Meadow ballpark in 1963. Capital Boulevard is behind the left field fence and the old Raleigh Cotton Mill is beyond. And now, the Devereux Meadow restoration project proposed under the Capital City Corridor Study is poised to become a reality in the next few years, with Pigeon House Branch cleanup included as a crucial component of the restoration project. This proposal consists of creating a 15-acre park at the site of the old Devereux Meadows baseball field that will cost around $5 million as part of the larger $60 million Capital Boulevard renovation. 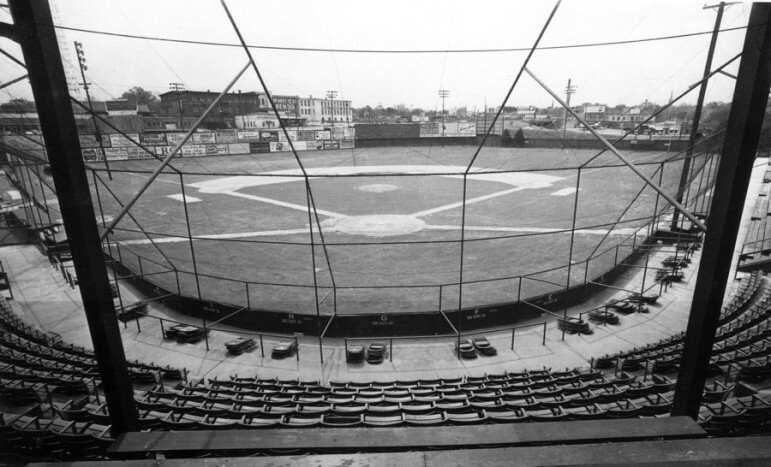 The Ballpark was built in 1938. It was torn down 41 years later to create a parking lot for city waste disposal vehicles. Former Raleigh Caps player Jim Mills questions whether the location could ever be the same after the demolition. “Somebody would have to build a park, and who’s going to do that?” he said. If all goes according to plan, there won’t be minor league baseball, but Devereux Meadows will once again be green. For Delcambre it’s important to put emphasis on this downtown segment of the corridor. “If they’re treating it as a gateway, then I think people will start to get really excited about it,” she said. According to Delcambre, water is a magnet for people, and walking along Pigeon House Branch could one day be exactly the escape someone needs.